Fact or fiction: can vinegar outperform dedicated limescale removers? No limescale remover to hand? You could do worse than grabbing a bottle of vinegar. Our tests found it shifts more scale than some popular limescale remover sprays. We were keen to put this traditional remedy to the test after it emerged as the most popular home limescale solution among Which? members in a recent survey. 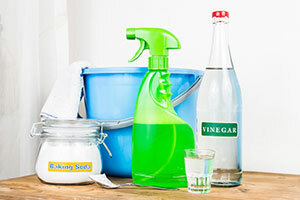 We tested distilled vinegar alongside 13 supermarket limescale remover sprays, including big brands Dettol, Cif and Cillit Bang, to find out whether it could compete with dedicated chemical cleaners. And the results surprised us: distilled vinegar cleared more limescale than four popular limescale removers. Vinegar was far from the best limescale-busting option we tried though. If you’re keen to keep your surfaces sparkling and limescale-free, check out our Best Buy limescale removers. Limescale removers are acid-based chemical cleaners which work by dissolving the calcium carbonate deposits that form the majority of limescale build-up. This is why acidic household staples such as vinegar and lemon juice are often recommended as handy home remedies. It’s a cheaper solution too – vinegar can be a third of the price (per 100ml) of some branded cleaners. Tempting perhaps, but we think you’ll be better off with a recommended limescale remover product instead. The very best limescale removers we’ve tested clean off significantly more limescale than vinegar, plus they’ll remove soap scum too. Vinegar won’t clean off this stubborn mix of soap, dirt and limescale that can form a grimy ring around your bath or sink. As you might have guessed, it won’t leave your house smelling particularly fresh either. Which? members who have used vinegar at home warned us about its “long-lasting smell” that “made the kitchen smell like a chip shop”. If eco-friendly limescale removal is important to you; we’ve tested alternative products from Ecover and Ecozone. See our full limescale removers test results to find out how they compare. Home remedies tried and tested by Which? It’s not just limescale removal tricks that we’ve put to the test. We’ve uncovered the truth behind whether other popular home cleaning solutions are fact or fiction too. Pouring white wine onto a red wine stain on your carpet is a popular tip, but not an effective one, our carpet stain remover tests found. Washing-up liquid and water is an effective stain-buster however, and was the best solution we tested on a common carpet stain. Find out what you should be using it for in our advice on carpet cleaning without chemicals. We’ve also investigated whether denture tablets are an effective toilet cleaner. Unfortunately this cheap tip didn’t make any noticeable difference. Read our story on using denture tablets as a toilet cleaner to find out more.